Junte-se ao seu guia especializado e pratique-se com um advogado para uma limpeza sem riscos com a lei nesta excursão exclusiva de meio dia a pé em Londres. 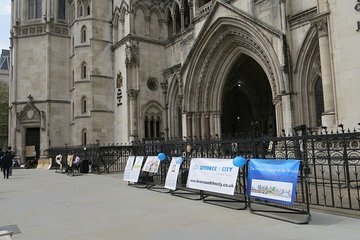 Adquira uma visão da lei em Londres, com visitas ao Old Bailey e ao Rolls Building, espreite um julgamento real na Corte Real de Justiça e pare para tomar chá na Sociedade Britânica de Direito. Questione o seu guia sobre as leis e a história legal da Grã-Bretanha e, em seguida, dirija-se ao Inns of Court, onde advogados compram suas perucas e vestidos icônicos. First off, the guide was NOT a lawyer, practicing or not. Obviously no legal system questions were asked or answered. To say entrance fees were paid is ridiculous as we went into only one building and it did not require fees. We did not go to tea at the British Law Society. Rather after standing in the street in front of the Old Bailey we went to some chain coffee place and bought our own coffee. Never went to Rolls Building nor did we go into any shop that sold wigs/gowns regalia. We also did not see a trial but she did try to get us in. We could have done everything we did do on this tour on our own and for free. Sadly, it was a total waste of the quite expensive price paid. A major disappointment. Mushin, our guide, was very interested in the processes of the Law in London. He had thorough knowledge of the Royal Courts of Justice, the Inns of Courts, and the Old Bailey. The Old Bailey was closed to visitors during our stay, but Mushin's overall interest and knowledge of the London courts system made the tour well worth the money. I know so much more about the Law in London than I ever had before. Excellent - very informative - exceptional guide - thoroughly enjoyed the whole tour. An excellent tour with a very friendly and knowledgeable guide. Loved the history as well as details of the various buildings.